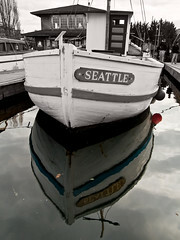 Thanks to one of Penopoly's suggestions for a photo stroll last month, the Seattle Flickr group did a stroll at The Center for Wooden Boats this past Saturday and had one of our biggest photo strolls to date. It's unknown exactly how many people showed up but we had 84 Yes RSVP's and several more Maybe's. The weather cooperated and the sun even came out for a little while. We had a lot of new members show up and it looked like everyone had a good time. We met up at the Nickerson Street Saloon afterwards for some drinks and food. If you want to check out the rest of my pics from the stroll, here is my Flickr set from the event.